Cory has been a user experience consultant for over 20 years. He is the Principal and Owner of Lebsontech LLC. Lebsontech is focused on user research and evaluation, user experience strategy, UX training, and mentoring. 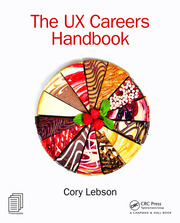 Cory also speaks frequently on topics related to UX career development, user experience, user research, information architecture, and accessibility. He has been featured on the radio and has published a number of articles in a variety of professional publications. Cory has an MBA in marketing and technology management, as well as an MA in sociology and a BS in psychology. Cory is a past president of the User Experience Professionals Association (UXPA) International and is also a past president of the UXPA DC Chapter. He lives just outside of Washington DC in Silver Spring, Maryland with his wife Aviva and three daughters. Connect on LinkedIn: Send Cory a LinkedIn Invite. He accepts LinkedIn invitations from all UX professionals and aspiring UX professionals.